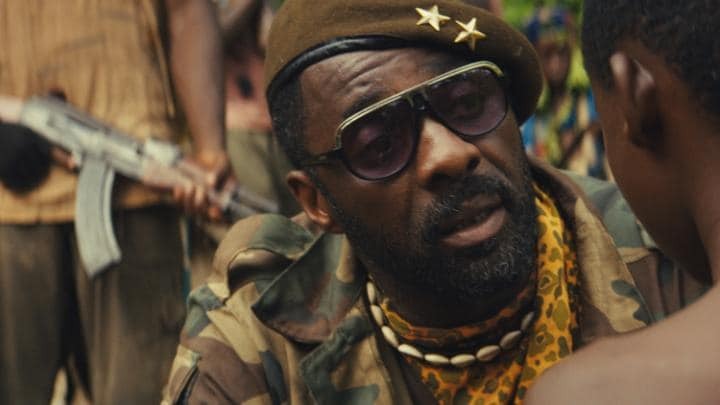 Netflix original film Beasts of No Nation is set to hit select theaters this Friday and the final trailer has been released. The trailer showcases for the final time how this film will incorporate Violence, Terror, Joy and Desperation all in one 2 hour picture. The movie and the trailers, have mainly focused on a young boy named Agu played by newcomer Abraham Attah. Agu lost his parents to war out in West Africa and joins a Mercenary unit led by Idris Elba‘s character who is simply known as Commandant. Young Agu narrates his story as we see him and the Mercenaries brutally fight back against those who terrorized the weak. However we also hear from him how he is aware he has done some terrible things in his life. The film will most definitely explore this young man’s journey during turbulent times. The movie is based off of the 2005 novel of the same name and it is directed and written by True Detective‘s Cary Fukunaga. The film will not only be released in theaters but also of course online on all streaming services including Netflix. Scroll down to catch the final trailer.